To the books, and to the moon! For a third week in a row we’re going back my grandfather’s books. That’s called a streak! 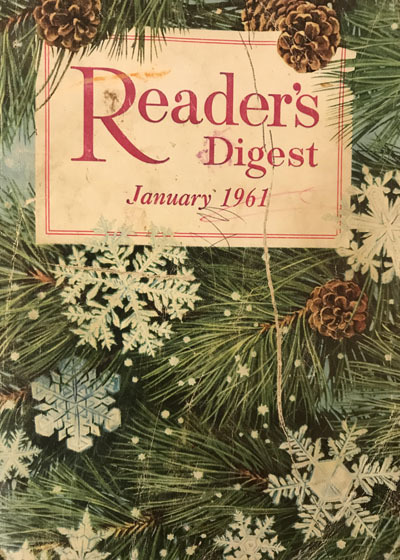 We’re working through the illustrations of a 1961 issue of Reader’s Digest that I got from the family compound a few years back. There are a stack of other magazines, too, and pretty soon we’ll be working our way through some classic issues of Popular Science. Which fits my grandfather’s interests just fine, but the work we’ll see today surely did as well. Four images to see today; click the book cover below to jump right in to today’s additions. See all of the interesting bits from this book here. If you’d like to check out all of the stuff I’ve posted from my grandfather’s books so far, start here. This entry was posted on Thursday, January 24th, 2019 at 10:31 pm	and is filed under books, family, site, Thursday. You can follow any comments to this entry through the RSS 2.0 feed. Both comments and pings are currently closed.